Owen Dell talks about how vulnerable we have become as a result of our reliance on commercial agriculture and how resilience and food security in communities can be created through well-planned communal food exchanges. 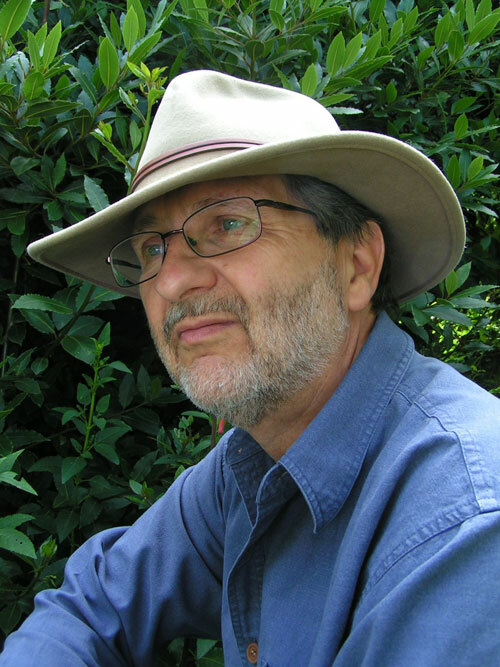 Owen Dell is an award-winning, internationally admired landscape architect, author and educator. He is the principal of Owen Dell & Associates in Santa Barbara, specializing in sustainable landscape architectural services. Owen has been part of the landscaping profession since 1971, and he has pioneered many of the practices of sustainable landscaping presently in use worldwide. Owen lectures around the country and internationally on sustainable landscaping and related topics. He is the author of How to Start a Home-Based Landscaping Business and Sustainable Landscaping for Dummies. Owen is also a regular contributor to many national and regional horticultural publications. He is the co-host and co-creator of the popular Santa Barbara television series, Garden Wise Guys. This is part one of a two part interview. The second part can be read here. I am very intrigued by this idea of edible landscaping because it entails going beyond just growing food in your garden to actually organizing food production in your neighborhood, creating hyper local food security and a self-sufficient community. Can you tell me a little bit more about how this edible landscaping works? Certainly. First of all, if you look at some recent history, an example of edible landscaping that comes to mind is Cuba. When the Soviet Union collapsed, Cuba was left without fossil fuels—left without anything. They had been kept on life support by the Soviet Union. All the sudden they were a little island out in the ocean and nobody was helping them anymore. They really had a very severe crisis. What they did, among other things, was begin to grow food everywhere. Havana is full of community gardens now and every crack in the sidewalk has some food coming up from it. The health of the people improved. They learned how to grow their own food. They became more self-sufficient. And they made it through that crisis. Derek Jensen talks about how people in urban areas, in big cities, have essentially no ability to care for themselves, or meet their needs. Everything that they need is brought in from outside —from farms, from imperial wars—to bring in resources of all kinds. The people live like [factory farm] chickens—in little cages stacked up against one another. All the waste is taken away and disposed of somewhere else. Now suburbs are terribly dysfunctional in so many ways. But look at the potential to transform them into something really magnificent because they have land, water, and sunshine. Now we expand beyond that to this whole idea of a food exchange which includes communal collaboration in creating complete food systems within an eight to ten block walkable neighborhood area. First of all, you can’t grow everything you need on your property, unless you have a lot of land, that just isn’t going to work. Some people might have microclimates that are more favorable to a particular crop. They may have a space for a large tree that maybe you don’t. The idea is to get together with as many of your neighbors as possible in what I call ‘tuning’ the neighborhood for a balanced diet. Number one is to evaluate the existing resources. How many fruit trees are there? What kind are they? What’s their yield? Who’s growing annual vegetables, etc.? Then see what’s missing and figure out how to plug in those missing elements. It could even involve people who do not want to garden. Say someone who’s elderly, or someone who is too busy and they just don’t have the time. What if they have a space somewhere on their property to plant a fruit tree or something? Someone from the neighborhood could come and take care of it, and then share the produce. Well, yes. We want them to take the fruit. Take the fruit. We don’t care who it is. That’s not the point. This isn’t about money. It isn’t about possessions or your property rights, or mine. It’s about ours. That’s what I see as being such a tremendous potential—to transform landscaping from primarily ornamental to functional. Have it actually do something that justifies the inputs of water, fertilizer, compost and labor. Begin to grow community and begin to build resilience so that we’re not so dependent on outside resources. What people don’t realize is that we have a three day food supply in most cities. Meaning, that at the end of three days, the supermarkets will all be empty. People’s pantries and refrigerators will be empty. The warehouses will be empty. Here again, Derek Jenson has made some brilliant points about this. Every day, stuff has to pour into New York City, Los Angeles, San Francisco, or wherever. Day and night, twenty-four hours a day. And don’t forget that waste has to be shipped out of the city. When that’s interrupted by civil disorder, by earthquakes, by whatever natural disaster, or war—what happens on the fourth day? What do we eat? Do we eat ivy? Do we eat juniper? Do we eat each other? If you read Jared Diamond’s book Collapse, this has all happened before. When people get to the fourth day, they literally eat each other because there’s nothing left. Could this happen to us? Yes. People are so confident that this system will continue to operate in the way that it has been operating. It probably won’t. And in fact — it already doesn’t. Think about New Orleans after Katrina. That was complete chaos. That’s not the first time something like that has happened and it’s not going to be the last time. If we had food in our neighborhoods; if we knew our neighbors; if we trusted our neighbors—think how much more resilient we would be. It doesn’t mean that we won’t have farms or that we won’t import food. Food miles aren’t the worst part of food production as I understand it now. I was reading something the other day which described the industrial agricultural system as a method of using land to turn petroleum into food. That’s crazy. If you take away the petroleum what do you have left? Nothing. It used to be sunshine that we turned into food. Now it’s petroleum. And that’s a very short-term, very blind way of approaching this whole situation. It’s not going to work for very long. Our society as we know it today, which is fossil fuel dependent, is only about one hundred and fifty years-old. This spike in technology, in comparison to the whole course of human history…the amount of time on a graph that we’ve used fossil fuel is a little needle. It’s a tiny little spike. You can hardly even see it. Everything before that and everything after that will be fossil-free. We have to start planning for that. Sure, people have lived without petroleum before. However, there weren’t seven billion of us back then. One part of the problem is that we’ve got to get the population down somehow, because it isn’t going to work with this many people. I want to see this work. I don’t care about making people feel better about themselves. I care about getting them fed, nourished, cared for, and develop neighborhoods that really work. I want to see this happen in a way that actually yields measurable, meaningful benefits, in terms of not only food, but social benefits. A key factor to self sustainability is not just being able to feed your family from the garden you have in the backyard, but for food production to happen on a communal level. Because if you’re the only person growing food in your whole neighborhood—that food is not going to last very long. Exactly. You’re either going to be nice and share it—then you’ll all be dead in three days—or you’re going to be nasty. It’s all about community, but unfortunately we’re being more and more isolated by our political system, by the kind of propaganda that is fear-based. Everything is about fear now. We don’t know our neighbors. We can’t trust our neighbors. They might have a meth lab. They might be criminals. When you know people, you’re not going to fight them and you’re not going to war with them in most cases, unless things really get extreme. Could we get to a point where we’re murdering each other over the bags of rice we have in the garage? Yes, we probably could. But I think it will make a meaningful difference when the time comes and the system goes down—and it will go down. The only question is whether it will go down in a controlled way or in a chaotic way. That’s up to us.